DiffPDF is used to compare two PDF files. By default the comparison is of the text on each pair of pages, but comparing the appearance of pages is also supported (for example, if a diagram is changed or a paragraph reformatted). It is also possible to compare particular pages or page ranges. For example, if there are two versions of a PDF file, one with pages 1-12 and the other with pages 1-13 because of an extra page having been added as page 4, they can be compared by specifying two page ranges, 1-12 for the first and 1-3, 5-13 for the second. 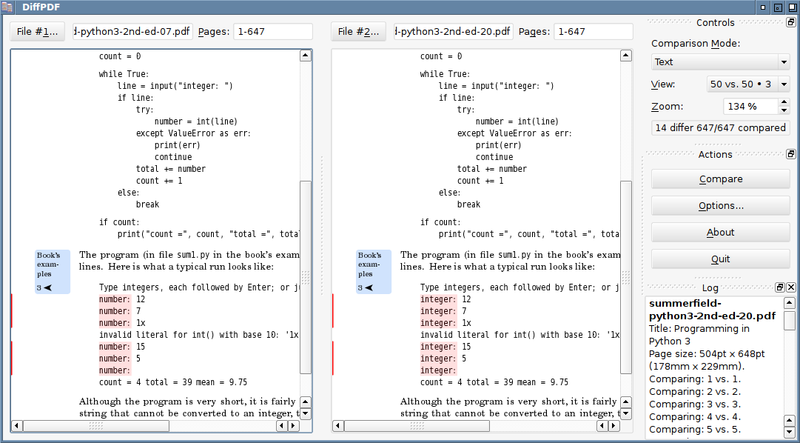 This will make DiffPDF compare pages in the pairs (1, 1), (2, 2), (3, 3), (4, 5), (5, 6), and so on, to (12, 13). A couple of example PDF files are provided (boson1.pdf and boson2.pdf) so that you can try it out. PDF files can be loaded from the GUI (by pressing the File #1 and File #2 buttons), or by specifying them on the command line. Thanks for such a great info and software. It was very useful to me. This is a great tool for weeding out duplicate and near duplicate pdfs.